In this course, you will configure and organize users into teams and assign permissions that allow them to review, use, or manage resources on Ansible Tower. You will also learn about advanced workflow management and receive a basic introduction to the Ansible Tower API. Install Red Hat Ansible Tower. Configure users and teams to access Ansible Tower resources using role-based access controls. Use Ansible Tower to manage shared access to inventories and machine credentials. Create job templates and workflow job templates to standardize playbook execution. Launch playbooks and monitor and review job results using Ansible Tower. This course is designed for system administrators, DevOps engineers, release engineers, and other IT professionals. 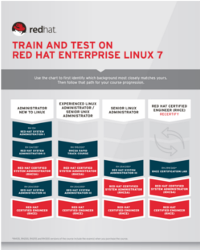 The curriculum is particularly geared toward those responsible for designing and implementing DevOps capabilities in complex multiple-application production environments; maintaining and enforcing continuous integration and continuous delivery (CI/CD) pipelines and tools; and centrally managing and controlling Red Hat® Ansible Automation at scale. This course is intended to develop the skills needed to leverage and extend the use of an existing Ansible infrastructure across business units in large enterprise environments. These skills are suitable for organizations seeking to increase cost savings and operational efficiency through wider adoption of Ansible in their enterprise. Deploy and use Ansible Tower to manage existing Ansible projects, playbooks, and roles. Use the visual dashboard to centrally launch, control, and monitor Ansible jobs. Configure users and teams and use them to control access to systems, projects, and other resources through role-based access controls. Configure which hosts to manage through the web interface, dynamically, or from a file stored in Git version control. Perform basic maintenance and administration of the Ansible Tower installation. Use the Ansible Tower API to launch jobs from existing templates. Explain what Red Hat Ansible Tower is and navigate and use its web user interface. Create user accounts and organize them into teams in Red Hat Ansible Tower, and assign the users and teams permissions to administer and access resources in the Ansible Tower service. Create inventories of machines to manage, and configure credentials necessary for Red Hat Ansible Tower to log in and run Ansible jobs on those systems. Create projects and job templates in the web UI, using them to launch Ansible playbooks that are stored in Git repositories in order to automate tasks on managed hosts. Use advanced features of job templates to improve performance, simplify customization of jobs, launch multiple jobs, schedule automatically recurring jobs, and provide notification of job results. Manage inventories that are loaded from external files or generated dynamically from scripts or the Ansible Tower smart inventory feature. Demonstrate ability to deliver routine maintenance and administration of Ansible Tower. Demonstrate skills learned in this course by configuring and operating a new organization in Ansible Tower using a provided specification, Ansible projects, and hosts to be provisioned and managed.